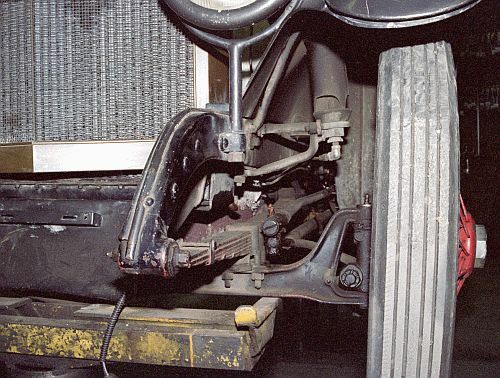 This photo shows clearly how Stanley arranged their semi-elliptical spring system at the front of the car. The fixed upper part of the spring assembly is the frame-rail of the car. The leaf-spring is attached to the front of the frame piece and relies on shackles at the rear of the leaf-spring to mate to the frame piece. Also seen in the photo are the steering arms and links. Marvin Klair placed a 3-note locomotive whistle under the car’s fender on a metal support. Photos of this car at parades and car shows often were taken when the whistle was sounding and the cloud of steam emanating from the front of the car resembled a severe boiler steam leak. Unfortunately the water and steam coming from the steam whistle coupled with the oils and dirt naturally present made this corner of the car a real dirt and oil disaster.